Gone are the days where someone is constantly at home keeping up with the upkeep around the home. Both parents are usually working, taking care of kids, involved in projects, or out on the town. Today’s modern family is constantly on the go. Any time spent within the home should be saved for spending time with your family, not the constant care and attention some flooring needs. Barrington Carpet & Flooring Design specializes in more than just carpet. Barrington also sells some of the most durable laminate flooring in Akron, Ohio; Canton, Ohio; North Canton, Ohio. Laminate is also one of the most environmentally friendly flooring options you can get for your home. 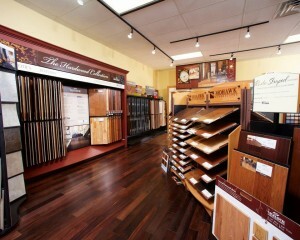 Barrington not only specializes in selling but also in the installation of laminate flooring. If you are searching for affordable laminate flooring, Barrington Carpet can help! If you have a larger family, kids, or pets you know that keeping your floors clean can be a daunting task. With laminate flooring you can get the look of hardwood or stone without the expensive or required maintenance. Laminate flooring usually is made from high-density fiber or wood particles, with a laminate overlay that is designed to look like wood or stone. A clear, hard layer is placed on top, giving the laminate floor its durability. Durable laminate flooring works well in high-traffic areas and in homes with pets. It is scratch-resistant and easy to clean. Barrington Carpet offers a lifetime warranty on all of their products but with laminate flooring, you will never have to worry about using your warranty. Installing laminate flooring within your Akron home can become an investment. If you are looking to sell your home or think that you may want to in a few years, laminate flooring has a huge resale value. Most home buyers are looking for hardwood floors instead of carpet. Laminate gives you the wood look for less and can make your home look more open and modern. It also is eco friendly because it uses less wood – if any – in its construction. Home buyers are looking for a way to keep their homes eco friendly and durable and laminate flooring gives you both. Environmentally friendly flooring options are what are going to be most viable within homes over the next few years. These flooring options not only increase your resale value but they also help keep your family healthier. The chemicals it takes to make other flooring options are less present in laminate flooring, making it a safer choice for kids and families alike. Once you decide which type of laminate flooring you want for your home, Barrington Carpet can also help with the installation of laminate flooring. Barrington believes that a great flooring business is made with equal parts manufacturing and installation. 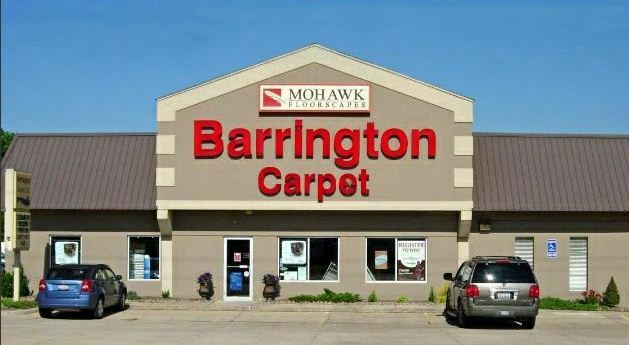 Barrington Carpet & Flooring Design hires only the best installation crews available that meet the highest of standards established by the store and their manufacturer partners. Laminate flooring at Barrington is hassle free for you from start to finish. Keeping up with your family and your activities should be your focus. You shouldn’t have to worry about making time to spend with your floor. Barrington’s durable laminate flooring is not only an environmentally friendly flooring option but they are also easier on your wallet. Barrington’s affordable laminate flooring will keep your home looking clean and spacious. Barrington Carpet & Flooring Design can take care of the installation of laminate flooring within your Akron, Ohio; Canton, Ohio; North Canton, Ohio home and help you find a design that complements your home’s personal style. To see what laminate flooring options are available at Barrington give them a call at 330-896-4141. This entry was posted in Carpet/Tile/Flooring, Home Furnishings and tagged affordable laminate flooring Akron Canton North Canton Ohio, Barrington Carpet & Flooring Design Akron Ohio, environmentally friendly flooring options Akron Canton North Canton Ohio, installation of laminate flooring Akron Canton North Canton Ohio by admin. Bookmark the permalink.